This Good Book Guide aims to fill out the content of the short statements of this creed which are so familiar to us. The Apostles' Creed is recited by Christians throughout the world each Sunday. For many it is a dull routine, and for others, it is spoken with confusion or doubt, rather than with confidence and joy. Do we really need creeds? Increasingly, people do not like the idea of pinning truth down. Others want to stick to the Bible alone, and think that creeds have no place in our worship. But most churches have found it helpful to have a summary of Christian beliefs. Creeds summarise who we are, they teach us what is important and they help us avoid error. In modern business language, they are our 'identity documents'. Purchased six books cheaper than anywhere else and all delivered super fast. Our group of mature Christians have enjoyed using these studies and have found them helpful, though some of the earlier studies on God the Father appeared to have a number of similar questions which tended to inhibit discussion. We have found that the studies contain a lot of material for a single session and we have normally split them into two. It is helpful that there are application questions within the studies and not just at the end. Our group is happily working through this but as with so many bible studies the writer seems occasionally to be coming from a strange angle. Good Book studies are generally much better than the alternatives but even in them some questions seem a little odd! A helpful overview which uses each line of the Creed as a springboard to explore thematically-lilnked bible passages, thus good for getting to know several parts rather than just one book of the bible. (This isn't a doctrinal explanation of the theology behind the Creed but you wouldn't be looking for that in a small group bible study series like this). It is the first of the Good Book Guide series we have used and was thorough, clear, well-structured, with attempted application (which is always the trickiest bit). It felt slightly more basic than the Interactive Bible Study series (Mathias Media) that we have used previously in our group of 'mature-aged' folk of long time church attending but with a range of biblical knowledge so if you have knowledgable bible folk in your group this may not be quite at the right level. However, it certainly met the need sufficiently for our group. Having the study leader notes at the back is certainly a helpful bonus! Thanks to the authors. We have used this study guide for a ladies home group. We are about half way through and are enjoying it very much. We find it thought provoking and stimulating and are enjoying the extra bits for 'homework' as we don't quite have time for it all. We take it in turns to lead and appreciate the excellent leaders notes. Even our newly baptised member is going to give it a go. We use this book with small group of youth leaders as a basis for study and we find it good for exploring our faith and what we actually believe. We also use it with a group of young people who don't really know what Christianity is and want to know the basics. Some of the questions are a bit basic but you can fly over them. 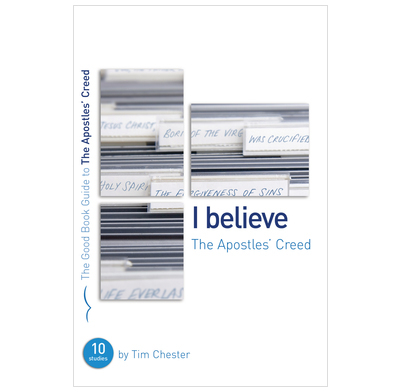 Our group have just finished studying The Apostles Creed using the GBC's guide. We are a mixed group with several longstanding members and some much newer to Christianity. We strongly recommend this guide - but for existing groups who are reasonably experienced in bible study. This said, we all,even the most experienced,felt that the notes were extremely helpful. We found them informative and clear and we paticularly liked the open-ended nature of many of the questions,which provoked much discussion. Our group members tend to talk well on a personal level so we appreciated the 'getting personal' sections. The lengh was about right for us given that there were extras that were optional. We were particularly impressed by the leaders notes which helped expand the study with relevant cross referencing and explanation eg of quotes from the Old Testament. We definitely intend to use Good Book Company guides again in the future. Elaine Brain. St Pauls Kingston Hill. easy to follow format. Lots of useful background information. Application questions are located throughout the study rather than all at the end which means they don't always get missed through lack of time. Extra study material makes it very flexible and means group members can take things further in their own time. Provoked good, thoughtful discussion every week.